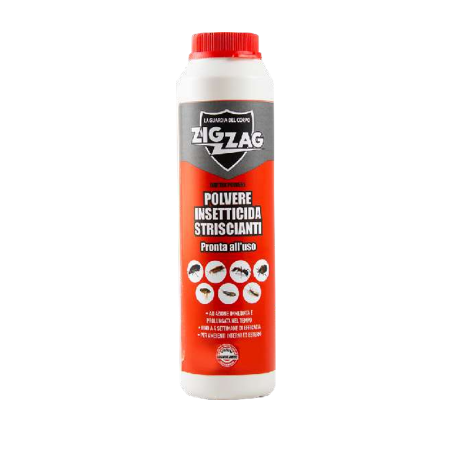 Zig Zag Insecticide Creeping is an insecticide ready for use in dry powder to action knockdown and residual up to 4 weeks. It is an insecticide indicated to quickly and effectively and infectiously deal with infestations from crawling insects such as cockroaches and ants. The product must be used for localized treatments, as described below, in domestic, civil and public environments such as homes, schools, cinemas, theaters, canteens, offices, warehouses, hotels, restaurants, garages and rural buildings. To be used exclusively for professional use in confined areas and in any case not accessible to children and pets. Without Permethrin = Increased safety for Cats! Contains Amaricante for the protection of children. This product is also available in 1 kg bottle. It is applied by uniformly spreading the dust in confined spaces, not accessible to the public, such as cracks and wall cracks, in the back of furniture and appliances, electric cabins, compartments and counters. Repeat the application if necessary. The product must be used for treatments located in domestic, civil and public environments such as homes, schools, cinemas, theaters, canteens, offices, warehouses, hotels, restaurants, garages and rural buildings. Foods and containers for food.